Regional Fields: In 1914 there were four military districts: Auckland, Wellington, Canterbury and Otago. From these regions battalions were formed to fight in the First World War. The Trust has assisted in the establishment of Regional fields of remembrance in Auckland, Wellington, Christchurch and Dunedin on ANZAC Day each year until 2018. The Trust gifted the crosses and researched the names of men and women from each region who died on active service to provide name labels. The crosses represent the men and women who firstly served in regional regiments and then those who can be identified as coming from that region. Replica Flanders Field poppies, symbolising hope and re-growth. The numbers of crosses will increase progressively each year as men who died one hundred years ago are added to the fields. Community Fields: The Trust has encouraged and assisted communities throughout New Zealand to establish their own Field of Remembrance to honour men and women from their community who made the ultimate sacrifice in the First World War. 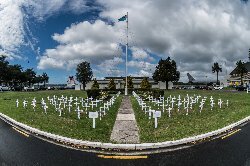 Fields of Remembrance will be established in the nine Military Bases/Camps throughout New Zealand on Anzac Day. This is a joint venture with the Ministry of Education. 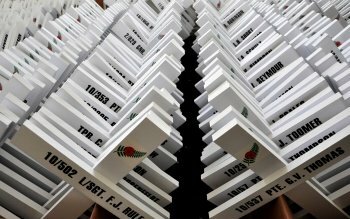 In 2015 nearly 80,000 white crosses were supplied to 2,531 Primary and Secondary schools. Each school received a pack of 30 crosses, a selection of name labels and poppy and fern stickers to go on the crosses, instructions for setting up a field, and holding a commemoration ceremony. Posters, a booklet and a replica Flanders Field poppy was also be included. In 2016 Early Childhood Centres were supplied with a pack of 3 small white crosses to commemorate the men and women who died serving New Zealand during WW1. Each cross will be named to include local soldiers, nurses, New Zealand Victoria Cross recipients, the youngest New Zealander who died (aged 17), and an All Black captain. One cross has the words “Known unto God” to represent the unknown soldier. Students are encouraged to investigate the life and experiences of these young lives so they are no longer just anonymous names on a commemorative wall. More information for schools may be found on the Ministry's website, including the lists of names for each region. Learn more.